John Godfrey (right) was born in Oxford in 1799 and baptised at St Ebbe’s Church on 3 June. He was the son of Thomas Godfrey (1762–1822) and Ann Chillingworth (1768–1840), who were married in Marston on 6 June 1788 and had seven other children baptised at St Ebbe's: Richard Chillingworth Godfrey (1789), Anne Godfrey (1791), Mary Harris Godfrey (1793), twins William & Thomas Godfrey (1796), Henry Godfrey (1803), and a second Henry Godfrey (1810). John Godfrey was for five years pupil and assistant to Frederick Symonds at the Oxford Medical Dispensary before moving to Charlbury to practise medicine, probably with Samuel Saunders. Elizabeth Williamson Saunders (left) was born in Charlbury in 1805 and baptised there on 18 May. She was the daughter of the surgeon Samuel Saunders and his wife Sarah Williamson, who were married at Charlbury on 27 April 1803. Her four younger siblings were also baptised there: James Arthur Saunders on 31 December 1806; Ellin Sarah Saunders on 21 May 1809; William Deacle Saunders on 18 February 1812; and Frances Georgiana Saunders on 3 January 1816. On Tuesday last was married, at St. George's Church, London, Mr. John Godfrey, surgeon, of Charlbury, in this county, to Miss Eliz. Williamson Sander, of that place. We are desired to state that the marriage of the above persons, (inserted in the last Oxford Journal,) which took place in London, was an illegal one, and the parties concerned in causing it to take place will be prosecuted. 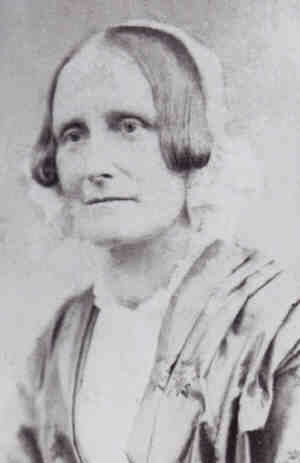 Ellen Godfrey (born in Charlbury in 1840 and baptised there on 26 August). John’s father Thomas Godfrey died in 1822, and soon afterwards his mother Ann Godfrey married her second husband, James Paxton. In 1828 John Godfrey announced that he was returning to Charlbury from Brill to practise medicine, and at the time of the 1841 census he was living at Thames Street there and described as a surgeon: he and his wife Elizabeth had three children at home: John (17), James (6), and Ellen (ten months). They had one male servant and two female ones. Elizabeth’s parents, the surgeon Samuel Saunders and his wife Sarah, were listed immediately after them in the Charlbury census; living with them was their granddaughter Matilda Silver (6), born in the East Indies, the daughter of Ellen Sarah Silver, née Saunders. In 1847/8 Dr John Godfrey's brother Richard Chillingworth Godfrey served as Mayor of Oxford. TO be SOLD or LET, with immediate possession,— A large, very convenient, and substantial DWELLING HOUSE, with good Garden and Field adjoining, suitable for the residence of a gentleman’s family, or for business, late in the occupation of John Godfrey, Esq. surgeon. The House consists of 17 rooms and offices, excellent stable, saddle room, and carriage houses.— Apply to Mr. Godfrey, on the premises. The house did not sell immediately, and the advertisement was repeated in September. In spring 1849 he was probably still at Charlbury, as on 10 March that year Jackson's Oxford Journal reported that John Godfrey, surgeon, had conducted a post mortem at nearby Spelsbury on William Simmons, who had been stabbed to death. On 24 December 1849 at Spelsbury, John Godfrey junior, described as a tradesman of Oxford, married Phillis Harris alias Smith, the illegitimate daughter of the farmer Robert Harris. 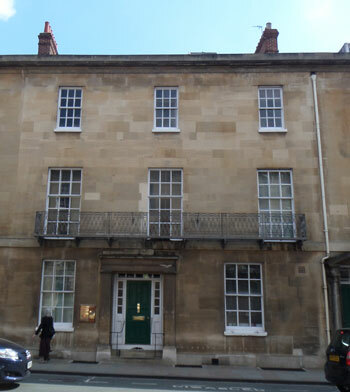 By 1850 Dr John Godfrey had moved from Charlbury to Oxford, and was listed in that year's Slatter’s Oxfordshire Directory.as a Surgeon at 37 Beaumont Street (in St Mary Magdalen parish). On 7 December 1850 he inserted a notice in Jackson’s Oxford Journal, giving that address and offering himself as a candidate as Surgeon to the Oxford Medical Dispensary, following the resignation of Frederick Symonds; but he was not elected on this occasion. By the time of the 1851 census Dr Godfrey (51), described as a General Practitioner (M.R.C.S, L.A.S. ), was practising in Oxford at 37 Beaumont Street in St Mary Magdalen parish. He was listed there with his wife Elizabeth (45) and their daughter Ellen (10), his niece Katherine E. S. Silver (19), described as an officer’s daughter E.T.C.S., and one servant. His youngest son James (14) was boarding at St Mary’s College in New Shoreham, Sussex. 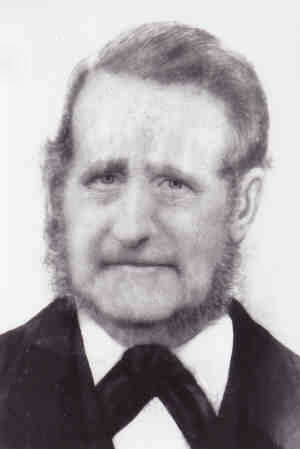 Henry Godfrey (born 1826), the second surviving son of John & Elizabeth Godfrey, emigrated to New Zealand and raised racehorses and farmed crops: he is credited with the introduction of systematic farming and the importing of the first water-driven flour mill in the area. 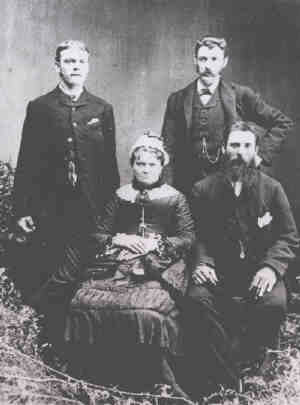 In 1852 in New Zealand he married Eliza Jane Harley, and they had five children. Sadly Henry Godfrey and the middle three of his children (Ellen, Alfred, and Alice) all died of diphtheria within a few weeks of each other in August 1868. Henry, who died on 22 August 1868 at the age of 42, was buried in New Zealand. His youngest child Ethel was born at Woodburn, Wairau Plains, New Zealand eight months after the death of her father. 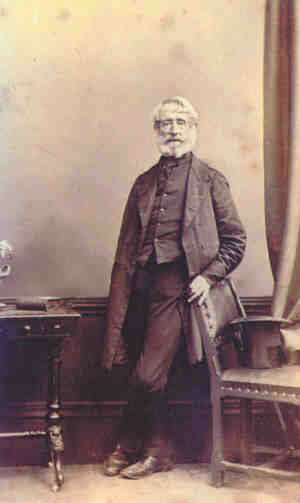 His eldest son Henry Charles Godfrey. married and had a large family in New Zealand. On 2 May 1852 John Godfrey was the surgeon summoned to Cardigan Street in Jericho to see Charlotte Noon (whom he had attended in her confinement ten months previously). Her husband, who summoned him, had inflicted a wound from which she subsequently died. On 2 January 1858 Dr John Godfrey inserted an advertisement in Jackson’s Oxford Journal, again presenting himself as a candidate for the office of Medical Attendant to the Oxford Medical Dispensary and Lying-in Charity, and this time he was duly elected. He held the position for six years, resigning in January 1867. By 1861 Godfrey, described as a surgeon, was living at a different house in Beaumont Street, No. 19 (left) with his wife and their daughter Ellen. An assistant surgeon was also living in the house, and they now had three servants. On 21 February 1867 at St Mary Magdalen Church, Ellen Godfrey married William Allin Thompson, a surgeon of St Aldate’s and the son of Alderman William Thompson. Their daughter Mrs Ellen Thompson née Godfrey died at the age of 27 on 11 December 1867 after just eleven months of marriage and was buried at St Sepulchre’s Cemetery: see adjoining grave. James Alfred Godfrey (right), the third son of Dr John Godfrey and his wife Elizabeth, was promoted to Lieutenant in the Royal Marins in May 1859, and in October 1861 Ensign by purchase. 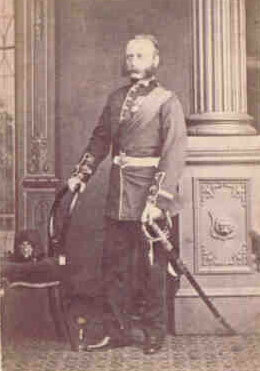 James was appointed Captain in the Royal Marine Light Infantry in November 1867. He died on the Isle of Wight at the beginning of 1869. His home was then at 1 St Mark’s Place, Anglesey, Hampshire. His body was brought to Oxford for burial in St Sepulchre’s Cemetery. † James Alfred Godfrey died at St John’s Park, Ryde, Isle of Wight at the age of 34 on 4 January 1869 and was buried at St Sepulchre’s Cemetery on 12 January (burial recorded in the parish register of St Paul’s Church). There is no indication that James Alfred Godfrey ever lived in St Paul’s parish. His parents may have purchased this family plot the preceding year when they buried his married sister Ellen in the adjacent space, but she too did not live in that parish. The time between his death and burial (eight days) was unusually long, and cannot be explained just by the distance the body had to travel; it may be that it was an unexpected death and the vault had not yet been built. His effects came to under £450, and on 27 September 1869 probate was granted to his widow Matilda, who had moved in with her parents-in-law at 19 Beaumont Street. By 1869 John & Elizabeth were alone, as all their children were now dead except for John Godfrey junior, who was far away in New Zealand. At the time of the 1871 census John (71), described as a surgeon who was no longer practising, was living at 19 Beaumont Street with his wife Elizabeth (65) and his widowed daughter-in-law Matilda Godfrey (James’s wife) and two servants. † John Godfrey died at 19 Beaumont Street at the age of 72 on 23 April 1872 and was buried at St Sepulchre’s Cemetery on 1 May (burial recorded in the parish register of St Paul’s Church). April 23, at No. 29 [sic: should be 19] Beaumont-street, John Godfrey, Esq., in the 73rd year of his age. Mr. Godfrey succeeded Mr. Wood as medical officer to the Dispensary in January 1858; and in January 1867 he resigned that office, which he had filled to the entire satisfaction of the patients and subscribers. His effects came to under £4,000. † Mrs Elizabeth Williamson Godfrey née Saunders died at 19 Beaumont Street at the age of 69 on 4 April 1874 and was buried at St Sepulchre’s Cemetery on 11 April (burial recorded in the parish register of St Paul’s Church). Her death notice in Jackson’s Oxford Journal read, “April 4, at her residence, Beaumont-street, Oxford, Elizabeth Williamson, widow of John Godfrey, Esq., in the 89th [sic: should be 69th] year of her age.” Her effects came to under £4,000. On 10 June 1880 at St Mary Magdalen Church Mrs Matilda Godfrey, the widow of their son James who had been living with her parents-in-law, married her second husband Arthur Edward Patrick Voules, a gentleman of St Giles’s parish. John Godfrey junior (born 1823) who had emigrated to New Zealand with his wife Phillis, was living at Wairu in 1853. He became well known in early New Zealand as a local politician, newspaper editor, and publican. Alfred James Godfrey (1856). The New Zealand author Janet Patterson Frame was descended from him. John Godfrey junior died at Picton, Marlborough, New Zealand at the age of 68 on 5 July 1891. A tiny roadside museum in a town called Renwick in the Wairau region of New Zealand’s South Island contains relics from the families of the two sons of Dr John Godfrey (Henry and John junior) who were instrumental in shaping this part of early New Zealand.